When Ruby meets Ford--an irresistible, kind, forbidden new Overseer--she longs to run away with him to the modern world, where she could live a normal teenage live. Escape with Ford would be so simple. But if Ruby leaves, her community is condemned to certain death. She, alone, possess the secret ingredient that makes the Water so special--her blood--and it's the one thing that the Congregation cannot live without. DROUGHT's main character Ruby is 200 years old, yet she has matured physically so slowly that she still looks like a teen. Would you say her way of life has kept her from maturing emotionally past the age of a teen or would that also be due to her unique physiology? Well, maturity definitely depends, in part, on physical development. So Ruby’s emotional growth has simply been as slow as her physical growth. However, her mother still treats her like a child –the entire Congregation does—and that is a big part of her still feeling “teen” too. Both DROUGHT and CANDOR concern dystopian societies that are limited in nature. Is there something about this limited scope that appeals to you more than a widespread dystopian society? Limiting a story to a single place helps to add to its claustrophobia and the pressing need to escape. But it’s funny you ask; the project I am working on now is a much wider world. But I do like starting with a smaller place and exploring it thoroughly. Perhaps that will change as I write more books. Which dystopian works influenced and informed your writing? I think everything I read influences what I write, whether it’s dystopian works, realistic fiction, or historical fiction! Probably one of the biggest influences on my writing was the science fiction of the 1980s, aimed at teens, like the novels of Lois Duncan and Mildred Ames. I have never forgotten how excited I was to find these books: something different, with slightly changed worlds, that still had “real” characters. Ooh! I loved Lois Duncan too! Which upcoming dystopian works are you looking forward to? I haven’t gotten to pick ACROSS THE UNIVERSE yet and I’m psyched to read it. I am also looking forward to the conclusion of the MAZE RUNNER trilogy. I’ll also be checking out BUMPED and ALL THESE THINGS I’VE DONE. Great picks! Ok...Mash-up time! What character from another book would you like to see navigate the world of DROUGHT and why? And what book would you love to drop Ruby into to see how she would handle it? I’d like to see Piper McCloud from THE GIRL WHO COULD FLY stop by. The whole flying thing could be a real handy talent in Ruby’s world… maybe they could team up and soar around Earth to find Otto. Plus I think Piper’s plain country self would get along very well with Ruby. I’d like to give Ruby a weekend in the world of THE PRINCESS DIARIES. Poor girl deserves a break and I’m sure Mia would show her a good time! Thank you so much for dropping by Dystopian February Pam! Visit Pam's website. 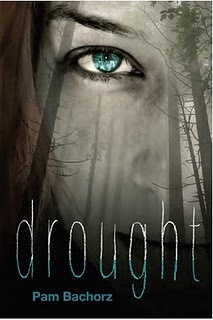 There you can read the first two chapters of DROUGHT, listen to a playlist and more! I read a really positive and thought provoking review of Drought over at Amy's site the other day, and I have to say that it really interested me. I also really liked this interview. It sounds like Pam is really approachable and down to earth. Thanks for sharing this with us, Lenore and Pam! Heather - I read Amy's review and loved it! Thanks for pointing it out. I haven't been around to the blogs lately as I've been traveling. I am so glad you asked the first question. Whenever I read about a character who is old in years but young in body, I become obsessed with the idea of maturity. Vampires, of course, are the most common variety of this. A "teen" vampire who is 100+ years old poses such an interesting philosophical question. Trisha - I become obsessed too - that's why I had to ask! It is interesting how different authors handle this. Claudia in Interview with a Vampire matured mentally past the age of her immortal body but I've seen many cases lately in YA fiction where this isn't the case. I love to hear the reasons behind it. Great interview! The mash-up question was loads of fun! Wow, this book sounds amazing. I'll definately have to pick it up!